Let me make this clear: tools are only as effective as the hand that wields them. Lord Shen took gunpowder, used in the making of fireworks, and developed cannons to defeat China. Something that was devised to bring joy to the masses was changed into something destructive which, had it not been for the fortitude of Po and the Furious Five, could have ended disastrously for China. 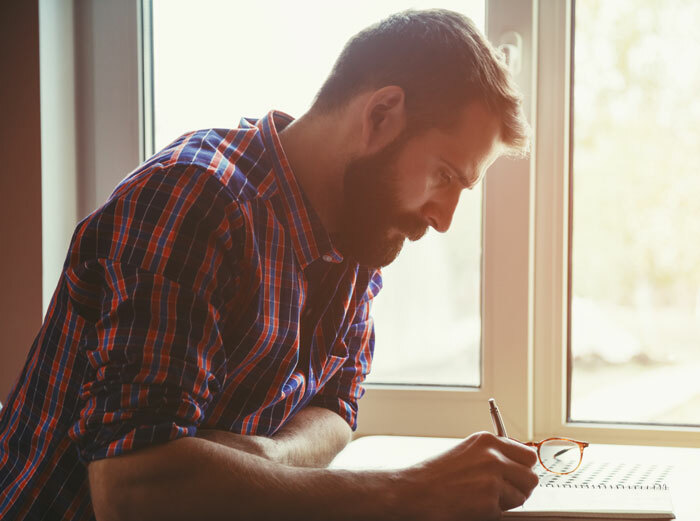 Let's take a look at why project cost accounting can lead us to further victory by embracing our past while securing our future. The Agile Team seeks to maintain balance: deliver the right functionality at the right time producing as much value for the business as possible. Scrum Master, Product Owner, and Team must work together to understand and provide the value. When business value is monetized, it becomes an easy value to track as a KPI, but hard to predict. What did we get for the $260,000 of labor costs we incurred for the team? In fact, what did we get for the $2.6m of costs we incurred for the Agile Release Train (Team of Teams)? If we were able to make revenue on the effort, then the math is simple: subtract the revenue from the costs and we see our net gain or loss. But we all know that actual financial management in any organization is decidedly more complicated. At least in the United States, there are tax breaks for Research and Development, differences between capitalizable and operational funding, and other financial aspects that many people who are much smarter than me spend their careers managing. Is there a way of reconciling our past models with our current and future state of agile? Can we gain the inner peace Master Shifu states Po (and by proxy, the audience) have yet to attain? There has been a debate raging on in the agile community around this concept for a few years. While I do not have all the answers with respect to this topic, I have a few ideas. One organization in particular comes to mind where this worked beautifully: a Value Stream with four Agile Release Trains (ARTs) was given their annual investment of $100m to be spread across seven Strategic Themes. The owners of each Strategic Theme came up with a series of initiatives and prioritized them against one another at each PI Boundary. Since Train costs are fixed at the Program Increment (PI) Boundary, if an initiative was completed, its cost was removed from the $100m pool. Any additional variables such as number of Sprints if an initiative was completed mid-PI were accounted for at the PI boundary as well. Simple, elegant, decentralized. However, there was still the need to understand how much of that chunk of money remained at each PI Boundary and whether additional funds could be allocated to another Strategic Theme or another vertical within the company if money was left over. In Kung Fu Panda 2, Po, upon being confronted with a pack of wolf bandits sees a symbol and flashes back to his youngest memories: he's seen the symbol before, but cannot grasp the importance of it. He only knows it's something to pay attention to. Much like when, in SAFe, we discuss the concept of Lean Budgets. We instinctively know this is something to pay attention to, but we still cling to project cost accounting as our method of reconciliation. 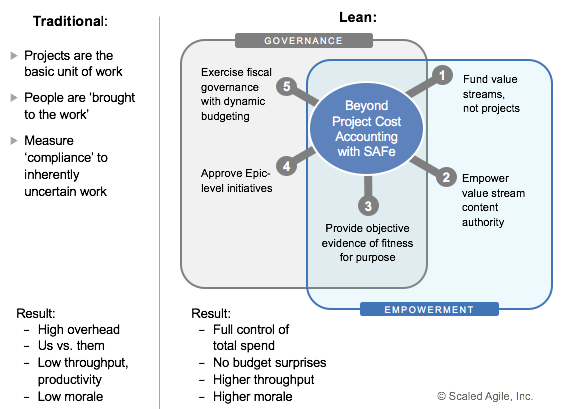 Below is an example of Lean Budgets in SAFe. The Lean Budgets concept strives to balance governance and empowerment while providing a simple funding model for a given Value Stream. A Value Stream is the organizational structure that provides a continuous flow of value through solutions to the customer (aka the Execution Engine). For example, a Value Stream can be a factory or a hospital. It can also be a development organization - as long as it is focused around solution delivery to a customer. Many organizations struggle to define Value Streams and instead loosely group teams together under a resource manager or other traditional reporting structure and call it an Agile Release Train. While effective on the surface, it complicates coordination across efforts. It's not until a common solution and purpose is defined that the organization can move forward. Lord Shen, as a common enemy across districts, aligns the Valley of Peace and Gongmen City. The teams come together with the needed resources to eventually defeat Lord Shen, but not without trials and tribulations. It is not easy to align an organization to value delivery just as it was not easy to eventually defeat Lord Shen. As I stated in the previous post, if Teams are fixed, costs are fixed. If Trains are fixed, costs are fixed. The only funding needed to produce a solution is to cover the cost of the Train. And the cost of the Train should be predictable through a PI. Assuming a single Train in the Value Stream, if each project team costs $260,000 per year, then a Train with 10 teams costs $2.6m per year. Divide the cost of the Train by the number of Sprints in the year (26), then multiply by the number of Sprints in the PIs (typically five), $50,000 is needed for the Train in the PI. Provide the Value Stream $50,000 and watch them work. Once a Value Stream is defined, Lean Budgets then states it is important to "Empower Value Stream Content Authority." Storming Ox and Croc sit, defeated, in Gongmen City prison. It's only when the Furious Five and Po join them and demonstrate their ability to win a single battle that the two become empowered enough to try and save their city. Before this initial battle, there was no plan other than escaping Lord Shen. The Stretch Goal was to also destroy his cannon. There was no meticulously created work breakdown structure. There were no step-by-step dependencies. There was a single solution the Train needed to implement: learn Lord Shen's plan, escape Lord Shen, regroup to create a plan to defeat him. Our Train (Storming Ox, Croc, the Furious Five, and Po) completed their objective and stretch objective simply by understanding their value and executing on a single purpose. If, as an organization, we instead try to use project cost accounting, we hinder the Train's ability to provide value. Project cost accounting starts with the goal: defeat Lord Shen. To defeat Lord Shen, we need all three Kung Fu Leaders from Gongmen City: Thundering Rhino, Storming Ox, and Croc. If we have all three, we can defeat him in a day and move onto the next project...er...battle. Three resources for eight hours = 24 resource hours. At $50/hour (our typical cost per hour), $1200 to defeat Lord Shen. This leaves the Furious Five and Po to defend a village from wolf bandits who, in fact, are Lord Shen's minions. The solution does not address the problem as a whole: Lord Shen is the root cause of the battles thus causing the Teams to move to the work. As we move through the story, it took the entire Train to defeat Lord Shen in just one battle and had Po and the Furious Five team members had content authority (knowing what Master Shifu knew about Lord Shen), they might have been able to save Thundering Rhino. There are three other parts of Lean Budgets we haven't addressed: Provide objective evidence of fitness for purpose; Approve Epic-level initiatives; Exercise fiscal governance with dynamic budgeting. Let's take objective evidence first. The System Demos and DevOps model addressed in the Program Level of SAFe provides the organization the ability to provide objective evidence. Is it working code in production with dark features toggled on? Yes. Value has been delivered to the customer. Did our intrepid warriors escape? Yes. They were able to escape Lord Shen. However, what happens if value was not delivered? What happens if it takes another PI to deliver the solution? Taking the foundational approach from the project cost accounting model, we have to fund the Train for a second PI. Instead of $50,000 to deliver the solution, it is now $100,000 ($50,000 per PI times two PIs). However, if the cost of the Train has already been accounted for, this is a simple shift in priority, not a movement of funding. You don't have to find another $50,000. Instead, you negotiate whether it makes sense to continue the effort or abandon it based on other value delivery priorities. The path to inner peace starts to become clear. This ties beautifully into the next part of Lean Budgets: Approve Epic-level initiatives. As we established, the funding is there. If after evaluating the fitness for purpose, the choice is to abandon the effort, the Trains and Teams do not disband. Instead, the work changes as priorities shift toward the next Epic-level Initiative - moving the work to the Teams and Trains. The costs remain constant: only "how" changes, not the "what". The Epic-level initiative is still to defeat Lord Shen: it is the approach that changes for Po and the Furious Five ultimately giving them the flexibility to deliver the victory to China. The Teams and Trains shift to the new strategy and work toward the solutions continue. Lastly, we address the final step on the path toward Inner Peace: Exercise fiscal governance with dynamic budgeting. Much like achieving inner peace, this is not something that is achieved quickly. The recommendation from SAFe is this is addressed semi-annually whereas project cost accounting re-evaluates every work effort once complete. If the effort is small (e.g. 1 month or two Sprints), the allocation of funding to the Team or Train must be evaluated off-cadence meaning mid-sprint or mid-PI. Depending on the internal procurement procedures, this can become a Herculean effort for Business Owners, Epic Owners, and oft times, the Team or Train. It is an unnecessary distraction and thoroughly disrupts the execution. Remember the Kung Fu Leaders of Gongmen City. The first battle with Lord Shen was lost when defined to a specific Team without the proper resources and an unrealistic estimate of the level of effort. Subsequent battles also proved project cost accounting failed the Team: the Furious Five were imprisoned, Po was injured and near death only to be saved by a soothsayer showing him the truth of his past. Po reached Inner Peace by embracing the tragedy of his past and letting go. However, we have to remember the lessons we've learned throughout the story. Understanding our past makes us better prepared to embrace our future and win battles. Project cost accounting is a great model when running an organization that is aligned to cost centers. But by realigning cost centers to Value Streams, the burden of project cost accounting is lessened and planning processes can become more efficient. When aligning to the quintessential tenet of agile, trust, you, too, can achieve inner peace.